During yesterday's 18-inning Blue Jays game, my brother Steve and I reminisced about the best games we've seen live. One such game, on September 18, 1992, featured a highlight from Domingo Martínez. Domingo Martínez was a beast, and with Rance Mulliniks on base after his final career hit, he hit a monster 2-run homer to deep CF. It was the first career homer for rookie first baseman Domingo Martínez and Steve and I wondered if he'd one day hit 50 in a season. Our hopes for him were sky high. We won that day 13-0 over the Rangers and Domingo Martínez finished the day 2 for 2. 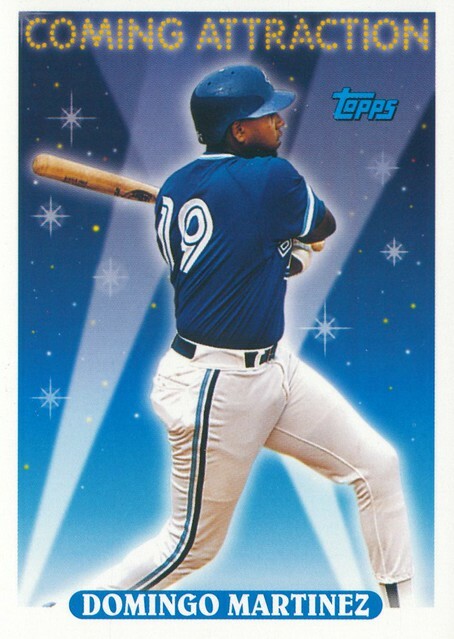 We were certain he'd get more playing time in 1993 and eventually replace John Olerud as our everyday first baseman. After all, he has so much power, and Steve and I agreed, he was going to be a star. Domingo Martínez played exactly 15 major league games during his career, hitting a grand total of 2 career homeruns. Sometimes, I'm wrong. This time, I was very wrong. What about Eddie Zosky? Were you high on him, too? Everybody else seemed to be. On Saturday my brother Ryan called Jurickson Profar a "can't miss" prospect. I replied with "remember Eddie Zosky?" Not that long ago Mike Wilner was hyping Travis Snider as the greatest Blue Jays that's ever been produced. I remember just before Snider was called up Wilner said this guy is a guarantee player, a for certain allstar and will be a yearly MVP candidate. Umm he was slightly off. aaron hill is the first guy in more than 100 years to hit for the cycle twice in one season. Too bad it wasn't in a Jays uniform, but I'm glad to see he's having a bit of a resurgence in the desert. I always did like him. Russ Adams came down with Steve Sax syndrome I think near the end of his time here.